This week I want to talk about shopping. I like getting new things, but I'm not a big fan of spending hours on browsing around stores and I am certainly not a fan of dishing out my hard earned cash without knowing I got a good deal. So this week I will tell you all about the websites I use to alleviate some of the shopping headaches out there. And if you are thinking... "I love to shop, this posting probably isn't for me"... you are wrong. If you enjoy shopping, that is all well and good. But do your browsing and key in on the item that you want and write them down. That way you can plug that info into the good ol' internet box and get those items for much cheaper. Woot.com- By far one of my most visited deal sites. It is one item each day on the main site and they also have branched into kids.woot.com, shirt.woot.com, wine.woot.com, and deals.woot.com that offer their own deals on items. Also, about once a month Woot has a woot-off, which means they are just cleaning up the warehouse and they offer flash deals many times, for a day or two, on items that were already for sale.... It's really fun to watch try and get good stuff on Woot-off days! Amazon.com- I am a huge fan of Amazon. I don't think anyone needs an explanation of what it is. The sheer size of the organization allows them the ability to offer the lowest price on most items you may be looking for. However, a lot of people have not heard of http://www.warehousedeals.com/ which is a deep discount side of Amazon. When things are returned and inspected to still be in working order or if Amazon has a ton on hand they will discount them heavily, so its fun to browse through the items and see if there are any items worth snagging. Gottadeal.com- Here is another deal site. This one, the Amazon warehouse, and Woot are not ideal if you as I previously mentioned, have something specific you are looking for, but they still might have what you need and you might not have even known you needed it. And this is called consumerism (not the protection of the rights of consumers definition). Pronto.com- This site searches several different retail sites and displays prices, so you know you are getting the least expensive price possible. Another site I use for this is google's shopping search. Because it's all about getting the lowest price and spending the least amount of time to find it. Plasticjungle.com- This is for all of you that like to give giftcards as gifts or even a way to save money if you know you are going to spend X amount at a certain store. You can get giftcards for discounted prices. The only disadvantage is that a lot of them are e-codes, so you have to be careful about what you are purchasing if you are indeed planning on gifting the card. Well... These are my favorites. I try not to spend a lot of money on myself, but when I do, it's imperative that I get the best price. And I know that a lot of you readers are extremely frugal like me, so I hope this information finds you well. As always, if you have any questions don't hesitate to ask! The book I read this week was 15 Minutes Including Q & A by Joey Asher. It's a book about giving great presentations. It's a book based around being simple and it does that quite well. I have seen quite a few presentations and Asher is completely right in his book when he says that people drone on about what the audience has no interest in. Presentations are not about showing your audience how much you know about a specific idea, but this is what a lot of people demonstrate. 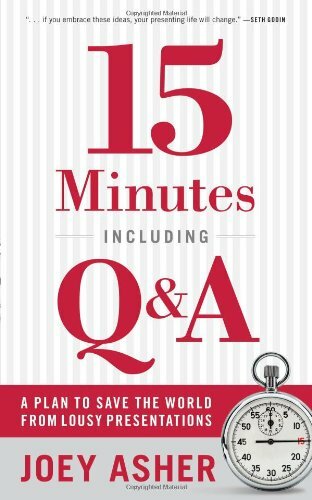 They go over the history or the idea, the problems that occurred when they were trying to find a solution to the problem, they tell the audience about 101 facts that they don't really intend the audience to know... they end up talking for long periods of time and want to demonstrate their knowledge. Presentations should have a purpose, they shouldn't just be done because of a mundane business habit. If there is a problem, you research a method to fix it, and then you present your pitch to an audience that can help you. Or you may be researching an idea and you are tasked with teaching a group of people the necessary information on that subject. Asher explains how to simplify your pitching or educating process. 7 minutes for your presentation and then 8 minutes for your Question and Answer portion. You need to present the problem, give the audience the three most important take-aways, recap your ideas, and then present the call to action. Don't waste your audiences time and don't pretend that your presentation is some kind of game to convince everyone how much of an expert you are. You should be an expert before you even start presenting. That's where the Q and A comes in... the audience is going to ask you questions, tough questions. And it's your job to answer them. "What is the ROI? ", "How long will the project take? ", "When will we be starting?" Expect every question and have answers to them. Another thing that Asher covers is Powerpoint presentations. And how a lot of presentations are based around the Powerpoint instead of the other way around. Having a Powerpoint presentation with 50 slides does no one any good. That is way too much information for any audience to absorb and your audience does not want to take the slides home to learn what you talked about... why did you waste their time by bringing them to a forum to show them anyway. I think Asher did a very good job of 'presenting' this book. He keeps it simple and that is exactly what is needed when you are giving presentations. You are there presenting information to an audience, you are doing a service to them, so... give them what they want and keep them interested. Asher covers lots of great things in this simple book. It's short, but extremely helpful. As always, if you have any questions on the book don't hesitate to ask. I would be more than happy to help anyone that wants it. This week I want to review a couple mediums for portfolio building: ING's Sharebuilder and Vanguard. Each one of these has a specific purpose for me. I use Sharebuilder to buy individual stocks I am interested in and I use Vanguard to buy into my index funds. You can use Sharebuilder to buy Vanguard indexes but it costs a little more money and it just makes more sense to buy the beef from the farm if you have the option. You can also use Vanguard to purchase individual stocks and bonds, but it is a little pricier than Sharebuilder after 25 trades. Choosing one or the other to do make your entire portfolio is completely fine (the $5 purchase difference is insignificant when you are trading with any larger amounts of money). I choose to mix it up because I am really nerdy and it's fun for me to try new types of investing avenues. It's great for Indexes because John Bogle, the founder, was the one the invented them. They are also a less expensive way to buy stocks, bonds, and ETFs when you are trading more than $500,000 in assets- only $2 a trade. The research area of the website is really tailored for the amateur investor, it's extremely easy to navigate and they don't use confusing jargon without explaining it first. I really like Vanguard's site! It's simple and has just the right amount of information. I think that a lot of investment websites are very intimidating for the novice investor and I don't get that same claustrophobic feeling from their site. The best way to utilize ING is to find companies that you like a lot and want to do reoccurring investments in because if you have reoccurring investments it's only $4 per trade. I like a lot of things about their research page, like, they have the mover and shakers on the main research tab, the details of companies are very thorough and analyst information is extremely easy to wade through. However, I think that if someone is completely foreign to this area of the world (investing) they would easily get lost in all the activity on each page without having much explanation. ING has a lot of great products and I am a huge advocate of their savings accounts. It really doesn't matter where you go to invest, but it is important to give it a try. It might not be for you and you would rather just stick your money under your mattress for the rest of your life. But you won't know until you at least try. I hope this helped a little, if you have any questions don't hesitate to ask! Happy Investing! If you are thinking about doing and don't know whether it's worth it or not... it really is. Nothing compares. Hope you enjoyed the video... let me know if you have any questions about my experience, I'd be glad to share! 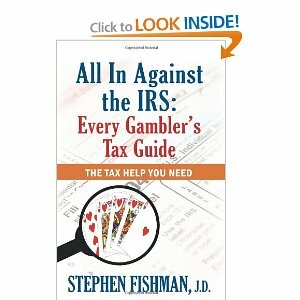 The book of the week was All In Against The IRS: Every Gambler's Tax Guide by Stephen Fishman. I am not a big fan of paying taxes. In fact, it might top the list of my least favorite things I have to do. But regardless of how much I dislike it, it has to be done. So I do my best to keep myself knowledgeable on different tax areas, so I can minimize my tax burden as much as possible. That's where Fishman steps in... I reviewed one of his books before and I liked it quite a bit, so I thought I would give it another try. He has a great way of taking a extremely dull subject and making it readable. This particular book by Fishman was all about gambling i.e. slots, poker, blackjack, races, etc. And even though I don't particularly think gambling is a good habit, it is somewhat fun to go to the casino every once in a while and try my luck. However, I never spend any money at a casino that I expect to come home with. For me I will just do $100 max and when it's gone, it's gone. For me this book is good for when that trip to the casino results in a mega win. However, the book is very detailed and it would be really good for anyone that goes to the casino on a very regular basis. The most interesting thing to me is the way gambling is taxed. There is a story at the beginning of the book about a man who $50,000 on blackjack. He didn't claim it on his taxes at the end of the year because he knew that he lost more than $50,000 that year too, so he figured it was a wash. He got audited and ended up owing $17,000 in back taxes. That guy had to find out how gambling taxation works the hard way... you don't have to. The main thing you need to know when you are gambling is that you need to track all your wins and losses. You can use a log, which Fishman includes in the back of his book, that has all the relevant information. After each session, which is basically when you get up from the table or slot machine in one seating. You can claim losses equal to the amount of your winnings, but not more. You can not use gambling losses as a deduction from any income besides gambling income. And your gambling log will be your records needed to 'prove' against your taxes. However, it helps to also have a brochure or hotel folio to prove you were there when you say you were as well. Something interesting that I learned from this book is that the player's card that track your activity at a casino can print off a win/loss statement at the end of the year from you. But, this can not be used as sole evidence to prove your winning and losses because they have disclaimers and you don't have to use a player's card to gamble every time. Another thing to note... Don't use the difference between your winnings and losses to plug into your 1040. There are separate places to put winnings, under other income, and your losses, under other losses. Lastly, don't think that you can get away with not reporting your winnings on your taxes. Certain gambling activities have different intervals in which the casino is obligated to report the winnings to the IRS. You definitely don't want the IRS sending you a big bill for back-taxes. I think Fishman did a great job with this book and I think it's a solid read. Not boring and easy to read. As always, if you have any questions on the book don't hesitate to ask. I would be more than happy to help anyone that wants it.